With 31 nations, so many participants from different countries are registered as never before. Almost 600 participants are currently registered. There are about 520 entries for the Sprint Cup. The first 300m races will start on friday morning. At 5 pm we will celebrate the opening and start the heats for mass start races. 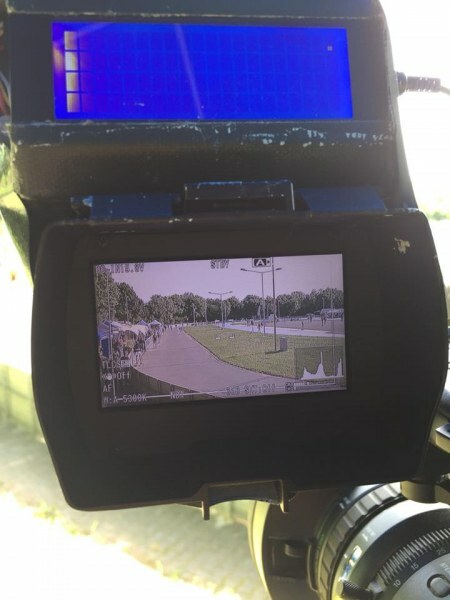 Like last year, we offered free Wi-Fi in the Skate-Park in cooperation with Freifunk Darmstadt and the district of Gross-Gerau. In addition, the livestream provided by Speedskate.TV was published via this internet connection. At peak times, up to 400 users were logged into the WLAN. These have transferred a data volume of about 100GB each day. In comparison, we had the data volume of 100GB last year all weekend. Many thanks to our partners for the support! As in the last years with our partner Speedskate.tv we provide a livestream for the final races of the EuropeanCup. This service is supported by Freifunk Darmstadt and the Kreis Groß-Gerau. Thank you! Our media partner, Echo Zeitungen, presented the next article in the series on the 40th Speedskating Kriterium Gross-Gerau. 26.04.2018 Wirbelwinde aus aller Welt von Stephan Stähler. The name of our head of Speedskating is Oliver Lohr. In the text is written Oliver Stolz. On Saturday and Sunday we offer you a small breakfast. 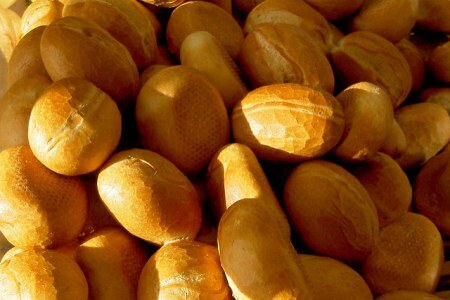 For 3 EUR you get two rolls with Nutella, jam, spread cheese and margarine. Breakfast, coffee and cake can be purchased at our counter next to the Skate-Park entrance. The TEAM T-shirts have arrived! Many thanks to all volunteer helpers! In eight days begins the 40th International Speedskating Kriterium. 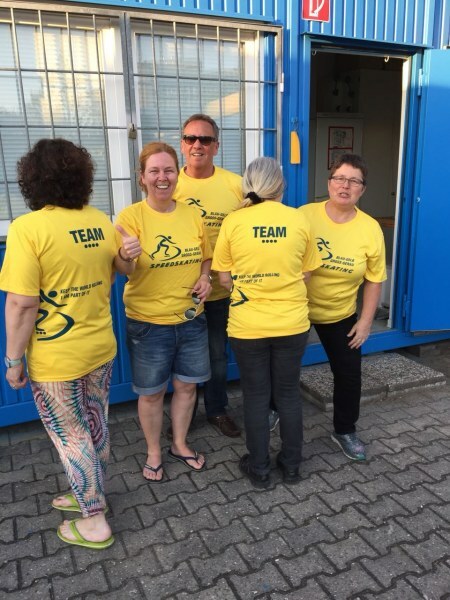 Today the volunteer shirts arrived. This will help you to better see who is available to support you during the event and answer your questions. 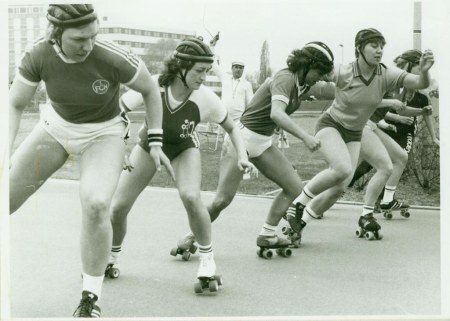 Hello to all former roller skaters and speed skaters! Register now for the Revival Race! Saturday, 28th April 4 pm at Skate-Park Groß-Gerau. 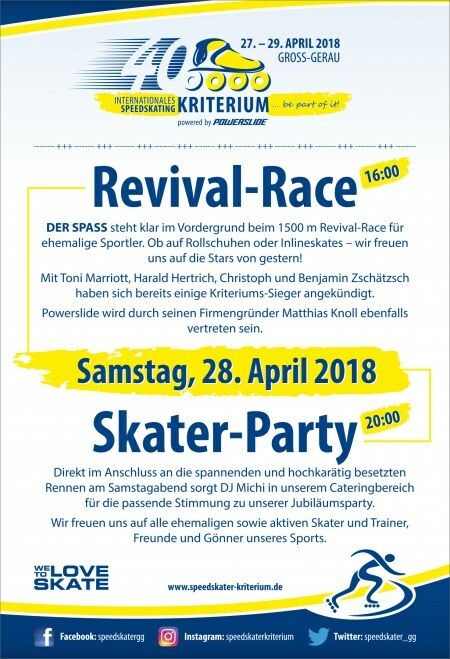 For the 40th Speedskating Kriterium, we invite all former participants to the revival race. In this race we will have fun and remember the past times. You can start with roller skates or inline skates. The distance is 1,500m, participation is free! Register now! Today, our media partner, Echo Zeitungen, presented the first article in the series on the 40th Speedskating Kriterium Gross-Gerau. 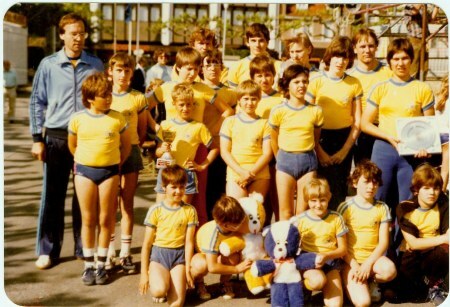 Everything started in the city center of Gross-Gerau in the year 1979. Editor Udo Döring has rummaged deep in the chronicle and compiled interesting numbers and information for the first edition. Only 20 days to go till the Kriterium will start. Our up-and-coming talents could already experience World Games winner Simon Albrecht and World Champion Laethisia Schimek on Thursday. Our up-and-coming talents could already experience World Games winner Simon Albrecht and World Champion Laethisia Schimek on Thursday. During the open training week for children between the ages of 4 and 15, Laethisia Schimek and Simon Albrecht gave another autograph session today after training. The offspring have joyfully demanded the signatures on helmets and skates. In 20 days, the time has come, to join our World and European champions from Gross-Gerau numerous TOP athletes from almost 30 nations and compete at the Kriterium.